Many Berber adornments from yesteryear had a significance, but still have a strong meaning now. From the amulet, the Khamsa to the silver bracelets, all these pieces were symbols of protection from the evil forces, self-defense or a way of showing a certain power. Nowadays, some of these items are worn as decorative jewelry. However, one of the most important form of ornament is the fibula. A fibula is a silver piece of jewelry that was worn in the past by women as a form of adornment. This item of jewelry was mostly worn in daily life or for special occasions such as weddings. The fibula was originally brought by the Romans in Morocco as a safety pin. Indeed, the fibula was used to fasten fabrics like cloaks. After some times, the fibula became less utilitarian and more decorative. Indeed, it is the Berber craftsmen who designed the Moroccan fibula and brought new meanings to the adornment. Berber craftsmen used handcrafted jewelry-making techniques. The heart of the silver craftsmanship is situated in the south of Morocco, in Tiznit.Indeed, it is the jewelry-producing capital. The Moroccan fibula consists of a triangle with a pin for fastening or two sections connected by a chain. The Moroccan fibula has different significations. The inverted triangular shape symbolises women and fertility whereas the geometrical tent form represents home and family. In previous times, an egg-shaped pendant (tagemout) was often attached to the fibula and emphasised the fertility of the woman who was wearing it. As seen previously, the fibula is clearly a powerful and meaningful sign. 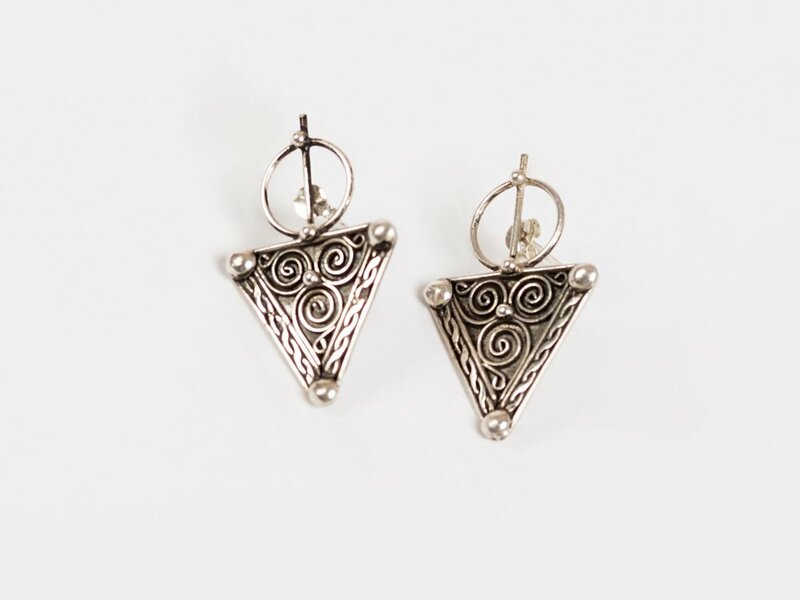 Also, each region in Morocco has its distinctive style of fibula which makes the adornment even more unique.The geometrical forms and the imperfect beauty of the fibula are the characteristics that make this piece of jewelry even more special.